A high percentage of cancer patients just "give up" once they are presented with their diagnosis and the grim reality by their doctors that their cancer has progressed. In reality, it is a very difficult emotional roller coaster and no doubt as that cancer patient, trying to get youself into a positive mode is by far, the most difficult thing you will ever do......but YOU DO NEED TO DO IT! Keep in mind that the medical community state the facts about your health, based on your medical tests, but they cannot predict your future! Your destiny lies in your own hands and in your determination to not allow cancer to win. It will be difficult for sure, but maintaining a very positive attitude is the first step along your competitive road. We all need motivation, encouragement and inspiration in order to obtain positive thoughts. You need to be inspired and you need a belief in a greater power that is beyond your imagination. Try not to worry about the medical report, but focus on reasons why you need to live. If you focus on the picture I've added here, you will see my husband standing at the most easterly point in North America, Cape Spear, looking out over a very rough sea. When we first arrived there last month, it was pouring rain and windy enough to blow one almost across the Atlantic. Amazingly though, once we stepped out of the vehicle to take some scenic shots, the rain suddenly stopped. Then miraculously, sunshine slowly began to emerge from the dark clouds above. 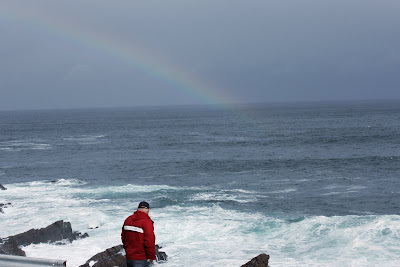 As my husband walked closer to the shore, another miracle..... a rainbow appeared......something like this cannot be created by man, but by God and instantly I was aware of His presence there in that early morning photograph. My husband has a great FAITH and inner strength.....and that is what gets him through. I notice this year that in many card shops and larger department stores, you can purchase wall plaques and free standing ornaments that display the following word BELIEVE. If you know of someone who is battling cancer this Christmas season and you are wondering what to buy for a gift, that would most definitely be the perfect choice. He/she will be able to display it at their home and it will help them maintain that positive attitude during their difficult moments. Such simple things in life aren't they???... a rainbow and the word BELIEVE.....but yet they have such an impact on another person's survival. well said as always Deb! and that was a beautiful rainbow & a beautiful morning. So glad we got to share it with you two. As I said in my e-mail Deb amazing things can happen. And as with my mom no treatment for 3 years now, 7 tumours, 1 has disappeared & the others have not changed. I know the feeling being with someone who has cancer. Went for my bloodwork yesterday & in comes the fellow who has RCC. We sat & compared notes for 1/2 an hour. I think we make each other's day. Take care, be strong & let us know.